Please contact us by email today with the full details of your custom stair treads. The length x width x thickness of the extra wide stair treads? The hardwood specie of the extra wide stair treads? 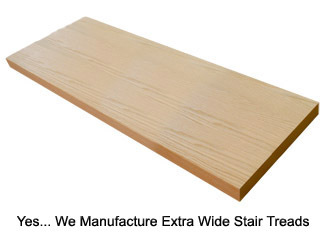 The amount of the extra wide stair treads that you require? The shipping address to where the product is being delivered to? If the shipment is a B2B or B2R delivery? ( no hidden fees and no missing details ). Copyright © Scotia Stairs Ltd. All rights reserved.